Today, we are living in a post-Christian and even anti-Christian society where the holiness of God is mocked, Christians are silenced, and the gospel is largely seen as irrelevant, even in many professedly “Christian” churches. 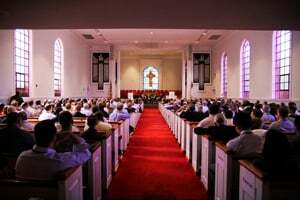 On September 17-18 in Washington, D.C., we held Ligonier Ministries’ 2010 Regional Conference to address the this important topic of being a Christian in a post-Christian culture. Thabiti Anyabwile, Robert Godfrey, Albert Mohler, Burk Parsons, R.C. Sproul (via video), and R.C. Sproul Jr. provided sound teaching as to how Christians can recover a biblical understanding of the world around us and, consequently, how we can reform our lives and our spheres of influence. “Tearing Down Strongholds” - R.C. Sproul Jr.
Visit our Facebook page if you would like to view our photo galleries from the event. Streaming conference messages will be available on Ligonier.org in a few weeks.